Thankfully the rain had passed and the weather returned to a light cold breeze. Good for football but chilly for spectators. The Chinese Dragons are another entity that has come from relative nowhere to recently build a number of domestic competitions. The Canadians of course have had a strong domestic competition for some time that has not quite provided the expected edge internationally. 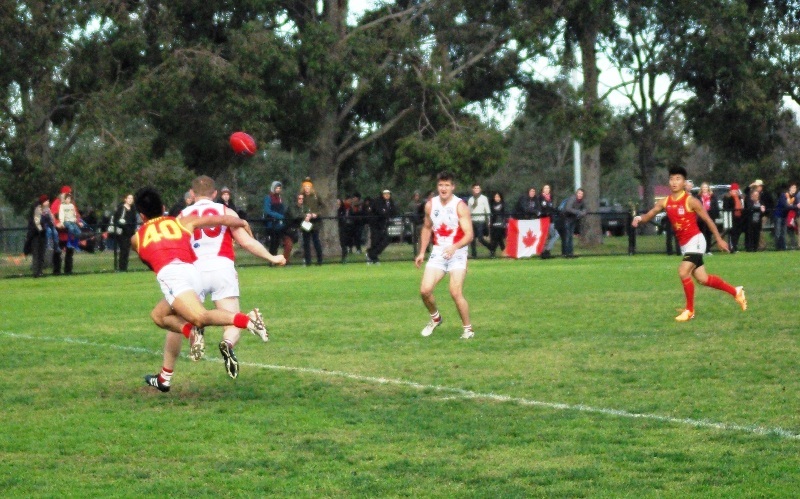 As the match began the Canadians immediately went into attack and that's where it remained for the quarter. With both Neil Casey and Read Conrad dominating the ruck the ball was continually punched into attack through Nathan Strom producing many opportunies for the likes of Michael Kolwinski who starred with two great mark and goal combinations. 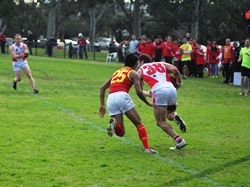 The second quarter saw the Northwind fine tune their play. Rotating their rucks and executing many lead, mark and scoring attempts with Michael Kolwinski and Adam Nash producing three and two goals respectfully. Rucks Neil and Read were used in the classical football positions of rotating through full forward producing some good marks and goals. In fact a good curling snap by Neil from a mark fell short only to be marked brilliantly on the line by Clay Lund for another goal. The Dragons put together some good passages but the Northwind always had someone in defence who could read the play, take a defensive mark and set up yet another attack. Dragon players worked hard all day. None harder than Peng Gao and others trying to get system into the Dragons' play under relentless pressure. In the meantime Canada played out some well-practiced moves running, handpassinng, leading, marking and goaling. Both the third and final quarters saw the Northwind work to the same successful formula of the second. 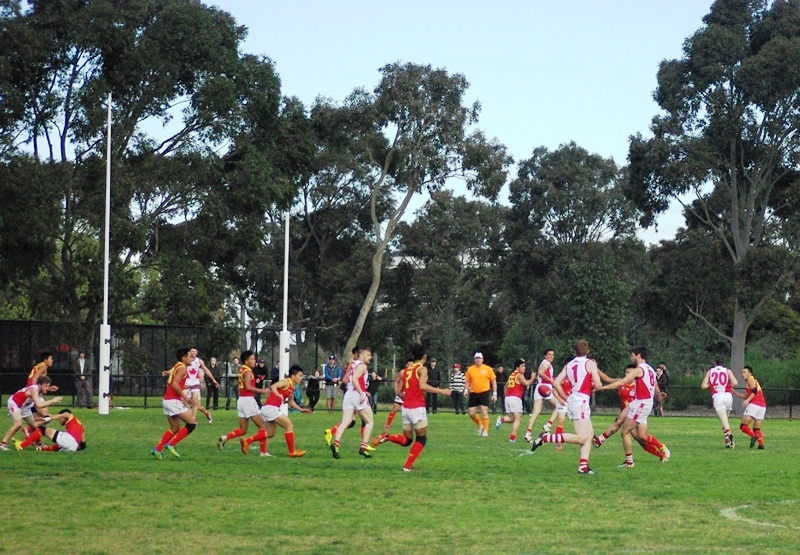 Though they weren't quite so clinical in the last quarter, maybe tiring or better opposition it was the still the best quarter for Northwind on the scoreboard. and defensively read the play very well. It will be very interesting how their games against experienced opposition will fair. 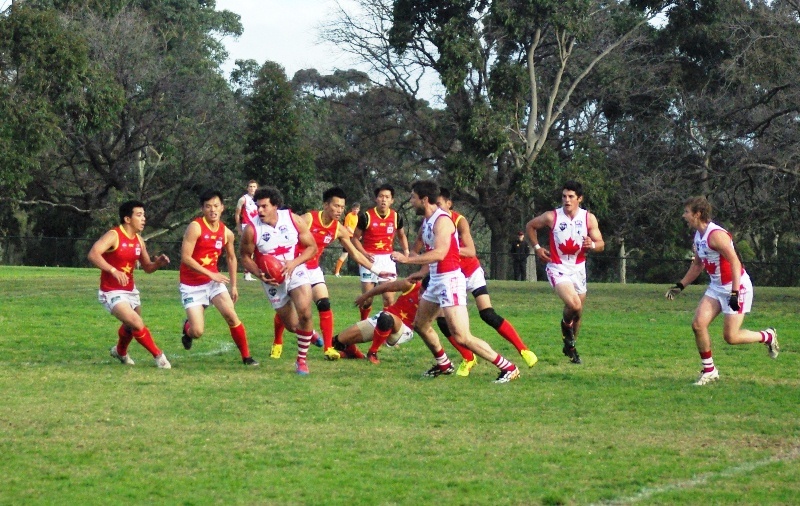 The Dragons can take heart that they have a lot of potential and international experience will help them immensely. They have the speed but need some key positional players.